For Freshman Orientation or Critical Thinking courses as well as a supplementary text for use in any subject-matter at any educational level.#xA0; This concise,#xA0;effective guide is designed to help students learn to think critically in anysubject-matter. #xA0; Learning to Think Things Throughpresents a#xA0;combination of instruction and exercises that shows the reader how to become active learnersrather than passive recipients of information, use critical thinking to more fully#xA0;appreciate the power of the discipline they are studying, to see its connections to other fields and to their day-to-day lives, and to maintain an overview of the field so they can see the parts in terms of the whole. 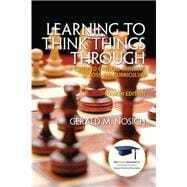 The model of critical thinking (used throughout the book) is in terms of theelements of reasoning,standards, andcritical thinking processes. This model is#xA0;well-suited#xA0;to thinking throughanyproblem or question. The 4thedition#xA0;reflects streamlined writing,#xA0;with changes and substantial edits on virtually every page. Dr. Gerald Nosich is a Professor at Buffalo State College and Professor Emeritus at the University of New Orleans. He has given more than 250 national and international workshops on all aspects of teaching for critical thinking. He has also worked for the U.S. Department of Education on a project for a National Assessment of Higher Order Thinking Skills, served as the Assistant Director at the Center for Critical Thinking at Sonoma State University, and been featured as a Noted Scholar at the University of British Columbia. On a more personal note, he has at times exercised and not exercised good judgment: he has ridden a motorcycle alone to the ziggurat of Ur in Iraq; has worked as an immigrant ditch-digger in Switzerland; been imprisoned by Communist authorities in Czechoslovakia; stowed away on a Sicilian ship to Algeria; sailed up the Nile with his family in a felucca; lived with Maasai warriors in central Africa; and traveled across the Sahara to Timbuktu. He is a Hurricane Katrina refugee and lives far from future hurricanes in Buffalo, New York. Chapter 1. What Is Critical Thinking? Some Definitions of Critical Thinking. Some Prominent Features of Critical Thinking. Three Parts of Critical Thinking. What Critical Thinking Is Not. Impediments to Critical Thinking. Deeper, More Pervasive Impediments to Critical Thinking. How Deep Is Our Need for Critical Thinking? The Experience of Learning to Think Things Through. Getting Started: Clarifying with SEE-I. An Overview of the Book That Lies Ahead. Chapter 2. The Elements of Reasoning. The Nuts and Bolts of Critical Thinking. The Elements of Reasoning. Three Additional Elements of Reasoning. How to Analyze a Piece of Reasoning Using the Elements. Example: Thinking Through the Logic of Getting Married. Trusting the Process. Chapter 3. What Is Critical Thinking Within a Field or Discipline? Definitions and Parts of Critical Thinking: Applied to a Field. Thinking Biologically, Thinking Sociologically, Thinking Philosophically, Thinking Musically … The Logic of the Field or Discipline. Learning the Vocabulary of the Discipline. Fundamental and Powerful Concepts. The Point of View of the Discipline. Impediments to Thinking Critically Within a Discipline. Trusting the Discipline. Chapter 4. Standards of Critical Thinking. Clearness. Accuracy. Importance, Relevance. Sufficiency. Depth and Breadth. Precision. Understanding and Internalizing Critical-Thinking Standards. Additional Critical-Thinking Standards. Non-Critical-Thinking Standards. Evaluating Around the Circle of Elements. Critical Reading. Chapter 5. Putting It All Together: Answering Critical-Thinking Questions. Critical-Thinking responses are provided for exercise questions that can be generalized to thinking critically in any discipline.